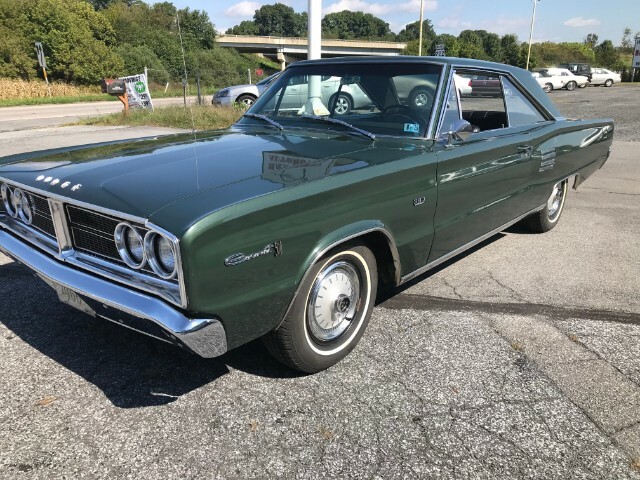 The '66 Coronet's new styling was exciting and very well received at the time, the first B-body that was 100% Elwood Engle designed. This car is powered by its original 383 engine, fueled by 4 barrel carbs and a 3 speed transmission. Its dark green with a black vinyl interior. It has AM radio with rear speakers, seat belts, day/night mirror, tinted glass, and white walls. The odometer shows just over 23,300 miles but its gone around once. We are selling this car for the third owner who has owned for 13 years. The previous owner had it for 18 years. This car was originally silver metallic. It was repainted about 23 years ago by Stizer Auto Body in Fleetwood, PA. The lower rear quarters were hand made and replaced. The right front fender was replaced by the original owner some years ago.This is a very solid car with just surface rust on the frame. The seat covers were redone in original type material and the bumpers were re-chromed. The gas tank was replaced, the front suspension was redone and hemi torsion bars and hemi rear leaf springs were added. The 383 engine is original to the car and was rebuilt by Carl Ruth of Reading. It is .030 over bored with a slightly more agressive cam. The pistons are 10:1, with hardened valve seals, electronic ignition, clutch fan, and a windage tray in the oil pan. The stock transmission was also rebuilt. The car has the original 3:23 Sure Grip rear end and can cruise at 18 to 19 mpg. The red paint trim around the rear facia plate is chipping away. There is some surface rust on the trunk floor but its solid. This car was pampered by its recent owners so there is nothing to do but enjoy it. Call for more info.